I’m about to get all tropical on you with WALLPAPER. Let’s explore why these 3 are at the top of my tropi-cool list and our recommendations for fun places to play with them if going “focal wall” is too much or just an overused concept in your design book. This Phillip Jeffries number (Fade, sage on white paper weave) oozes colors of the sand and sea. Layers of blended goodness with a tasteful, non-stereotypical, coastal vibe. The application in this bedroom by LeBlanc Design gives me all the calm, tropical feels I need in life. To get a bit more playful and non-committal, here’s a removable option from Tempaper - the Flora collection. The palms have a great structure, they’re bold without being annoying, and the colorways are fabulous. This print lends itself to some mid-century modern vibes…I see streamlined, walnut furniture with woven, airy pendant lighting adorning the ceiling. 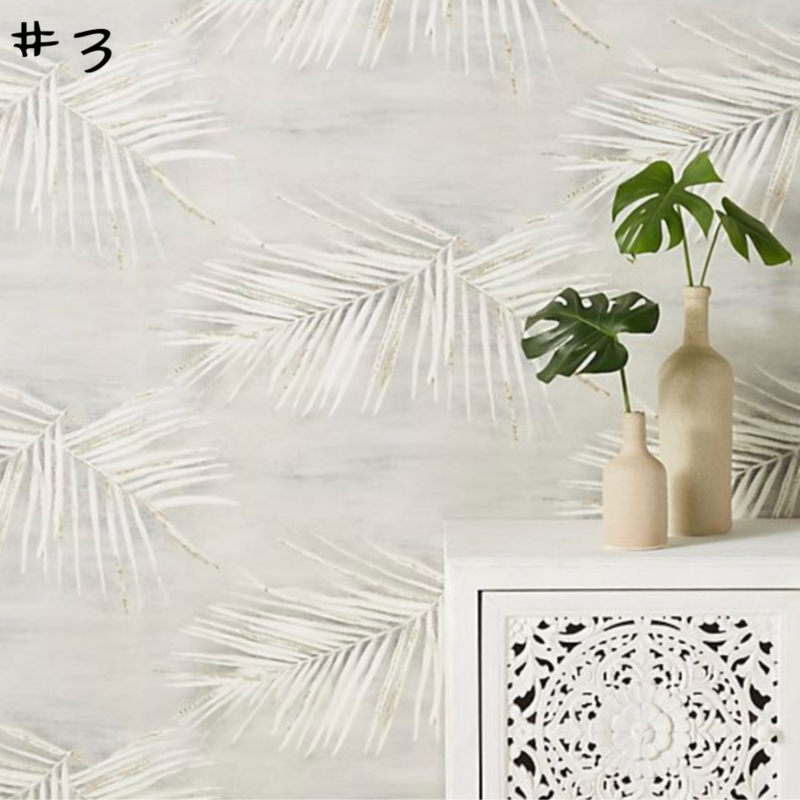 In addition to the name of this Anthropologie paper (Endless Summer), I also love its sophisticated take on palm fronds. Shown here in the grey (my fav), you can actually feel the movement of the print, almost as though you’re swaying with the palms in the breeze. It’s bold enough to get your attention and subtle enough to allow other pieces to have their moment in your design. 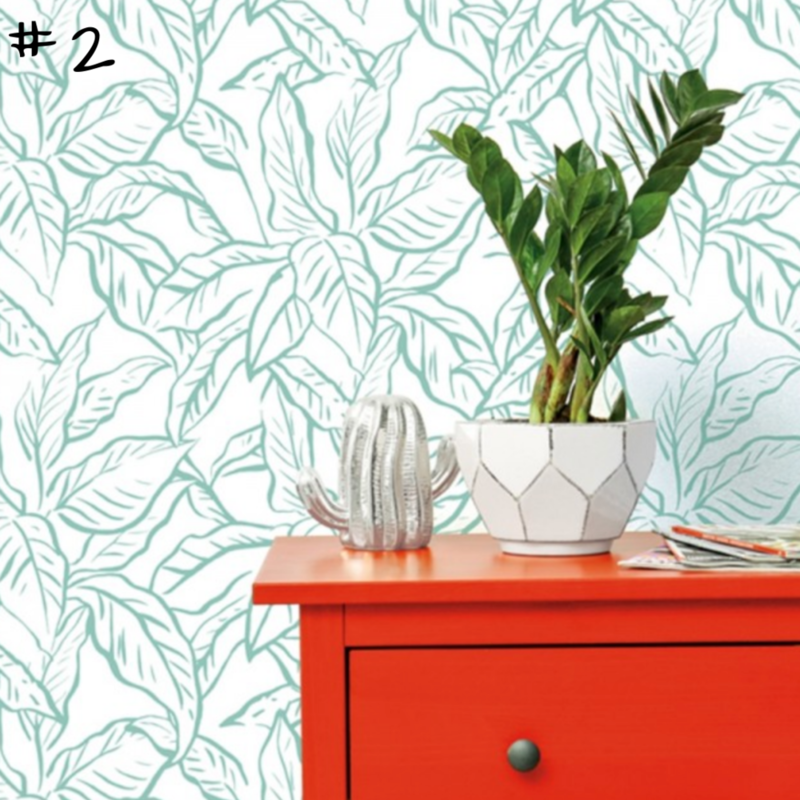 Where Can You Experiment with These Wallpapers in Your Home? The backs of your wood dining chairs you can't replace but want a fun refresh! That vintage cabinet with the cracked door…nothing some pretty paper can’t spruce up and beautify. Your ceiling. We live in a texting world of looking down — let’s look up like we’re lying on the white sands of your favorite beach and watching those palms sway! The backs of your kitchen cabinets or inside your drawers — even if your kitchen renovation is a distant goal, why not spruce up your mood by adding fun paper so putting away the dishes is more colorful? Sliding closet doors! You know, the not cute kind. That temporary paper can also add temporary cuteness! Newer PostLive in a Tropical Paradise? Materials Matter.